Certainly very powerful effects. I am really looking forward to this coming out next week. Everyone is going to have to pack some direct wounding or destruction to deal with these before they get out of control. Bootlegging Operation (TSC), Degenerate Gambler (TGS), Smugglers (TWB) + all the put into play from deck effects work on fated. Love how Sieur is a response, not a forced. Also, Jeanne can be so nasty with things in the gound. You can easily have 10+ characters to commit. Agreed, I am really digging his artwork and ability. I really like this Fated mechanic. It allows for some really powerful effects. The FFG schedule shows it's shipping, so that's a step forward. I've been waiting for this box to make a batch purchase, so I'm antsy, too. I'm thinking I might pick up the Revelations cycle, along with Key and the Gate. Or Summons of the Deep. I dunno. So many choices! I'm going to try using Hastur's Huntsman with The Enchanted Wood, maybe even with The Rays of Dawn for a little daytime control. He might even be good to combine with effects that force opponent's to commit characters. I'm a little worried about the mill character though. When mill goes off it can sometimes be hard to stop. 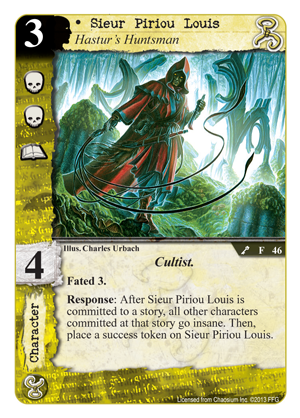 Before mill has been on very conditional cards that don't do anything in and of themselves, like the conspiracy, or that unique attachment, but now this is in a decent character, and you can't get around committing characters to a story sooner or later. I think she is tempered a little by the fact that she has no combat, so you pretty much need other combat characters to commit with her, but still, this will force your opponent to spread out at stories instead of ganging up on one, or not commit at all until she's removed some other way. What the Fated mechanic will ultimately do to the meta, however, is force players to play more direct removal (wounding, destruction, sacrifice, etc.) so that players can't recycle the character into their deck to play again later. It's much better to get it in the discard. Now what about Whateley's Diary (DD)? Could that be useful in removing success tokens from fated characters? The latest news article about the new box actually talks about this! 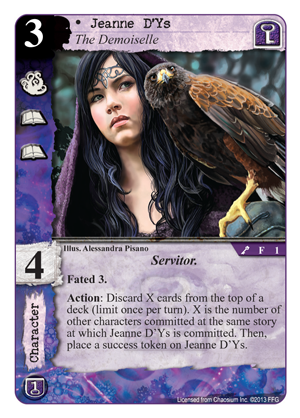 In short, you could redistribute tokens to other non-story cards, but not to stories. It seems strange that it works for non-story cards since it specifically says "among stories" but maybe it's going to receive an errata. When a card effect directs you to redistribute tokens you cannot switch tokens between players. You cannot redistribute tokens from story cards to non-story card or from non-story cards to story cards unless the card effect specifically says otherwise. Ah! I'd seen Wilbur himself played with success tokens, but only twigged about the diary's potential utility when flipping through cards yesterday. I anticipate making a few decks that shuffle success tokens among a number of cards without a whole lot of benefit for the effort involved. I suspect you're right. While it's cool to be able to move the tokens, I doubt there would really be that great of an effect. It's possible to use them with Rituals, I suppose, but it seems like it would be easier to just replay the character when it's returned to the deck, since if you have 3, the chances of drawing it again go up each turn. What do you all think of these other two cards? It's too bad that Nepenthe shuts down some of the very best Yog cards like Glaaki, Faceless Abductor and Many-Angled Thing. It seems also that a new theme is developing with MU to discard cards to cancel effects (a la Alternative Historian). 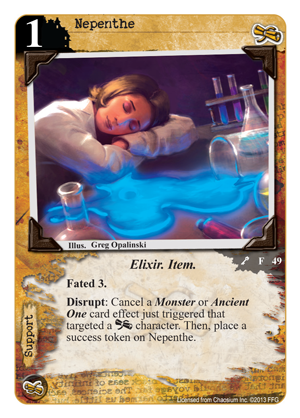 Professor of Folklore (ER) already, so the extra protection from sacrifice effects might not be worth it. Nepenthe is also just ok to me, the ancient one ability is nice, but I usually shy away from situational cards when I can. My luck I play it and go up against Syndicate - now I just have dead cards to draw. That's why I like Dr. Laban Shrewsbury (WaB) for AO protection; worst case I can just play him as a character. 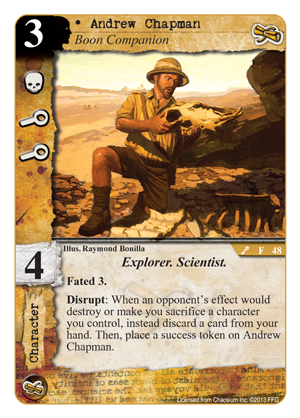 But I do like Chapman because he can slot into an explorer deck. Along with Roald Ellsworth (SoK) and James "Cookie" Fredericks (SoK), you can do some discard shenanigans, maybe with these new discard effects coming out in the Key and Gate. Also, he does not require you to pay for the effect like Professor of Folklore. I agree - I think he fits best in a mono-misk explorer deck. I might try that build now, haha. I was actually thinking of MU/Yog explorer and yithian. It is about time that they started to negate some of the powerful abilities in this game. One of the real problems with CoC is that the games can really get away on you and you feel that there is no way you can come back. Some of the AO have stupid powerful abilities and cards like facless are also off the chain. The idea os throwing a spanner in and really shacking up the meta is a good one. .. can not wait for this to get to my door! Placed my order just now. Looking forward to cracking this open when it arrives! The TO for the Roseville regionals just posted in BGG that Key and the Gate is available there, so it should be in stores soon! "Also, the new Yog-Sothoth expansion, 'The Key and the Gate' is currently available at the Event Center, will soon be available at retailers across the nation, and will be legal for the tournament."